One of the most successful American artists working in the 1970s and 1980s was David Grove. He painted movie posters for blockbuster films and illustrated covers for best selling books. Almost every major studio and publisher including Disney, Fox, MGM and Warner Bros. wanted to hire David Grove. He was living every artists dream, making a lot of money to draw and paint what he loved, and having millions of people love and admire his work. The Outsiders (1983) and Lethal Weapon (1987) movie poster art by David Grove. David’s work was well crafted and of the highest quality, but it also had a unique look. One of the things that made his work special, besides his excellent drawing skills, was the way he used color. He used a very simple and powerful strategy and technique. This technique is so simple that it has become a mystery to most of the art world. For this lesson, we’re going to start with two of David Grove’s favorite colors: Burnt Sienna and Ultramarine blue. Burnt Sienna is another earth tone like Burnt Umber but is more orange and more saturated. Ultramarine Blue is “cool” color that is part blue with a little bit of violet. These colors are what’s known as complimentary colors. Which means they are on opposite sides of the color wheel. 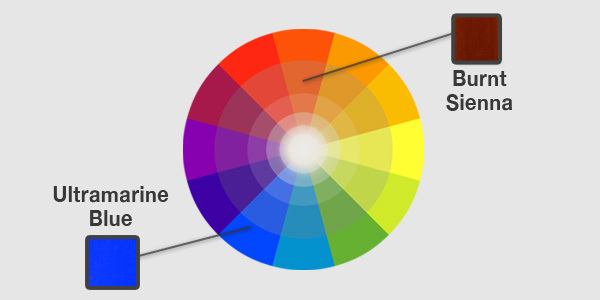 I don’t want to get too technical here, so if you want a more information, see this video on the properties of color. The important thing to know about these colors is that they look great together! Especially when used correctly.